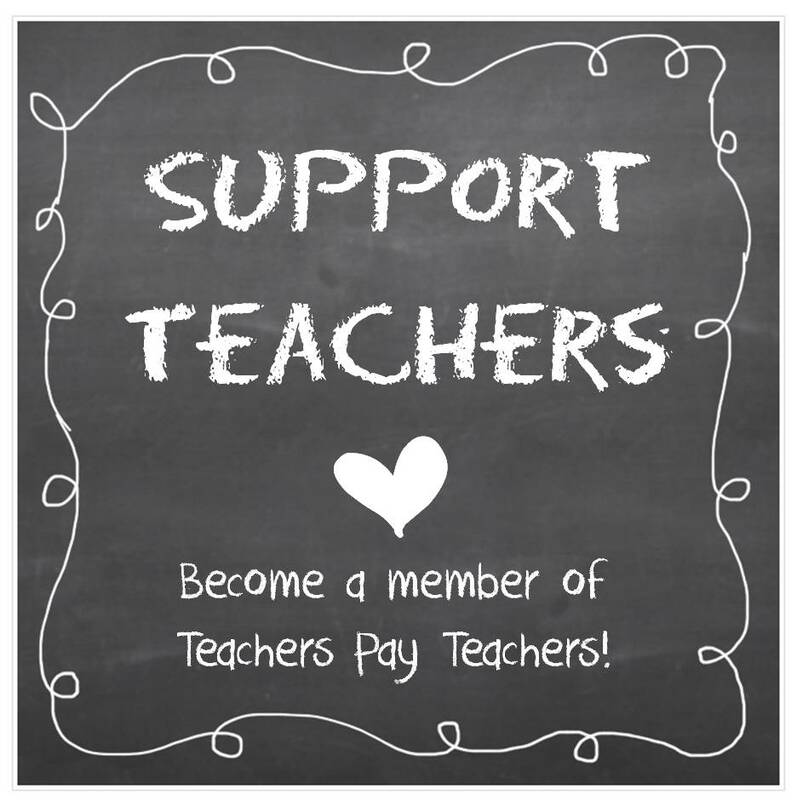 Donor’s Choose – How do you spread the word? Oh the places you’ll go with a good story! Oh, how I love celebrating Dr. Seuss! 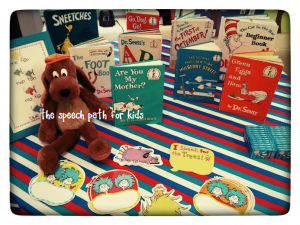 We actually started last week because I wanted to be able to give my kids some experience with the stories and vocabulary before their class lessons this week. Using Dr. Seuss stories, there is so much that can be done across all skill, interest, and age levels. Some of my students have been working on labeling vocabulary and sorting into categories. 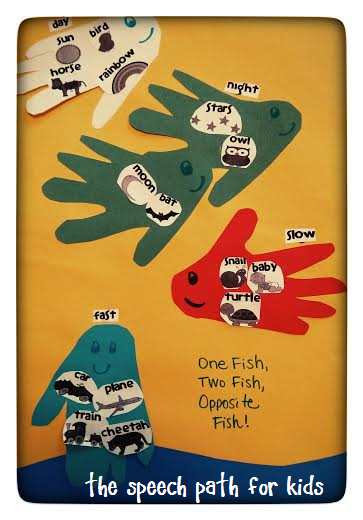 We read “The Foot Book” and “One Fish Two Fish” to find examples of wet, dry, fast, slow, day, night, big, and small. 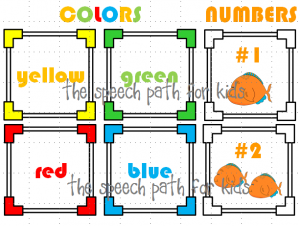 Then we sorted the pictures into either two or four categories, using the colored blocks. My main craft was Pinterest inspired and focused on “One Fish, Two Fish”. Due to attention span and my short group times, I read only portions of the story with my students first. We highlighted concepts and opposites as we read. Then I used a simple choice board to make the poster. 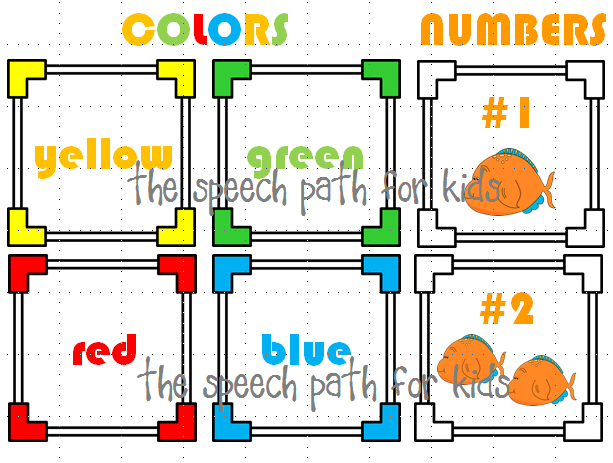 We were able to work on numbers, colors, location, and directions. 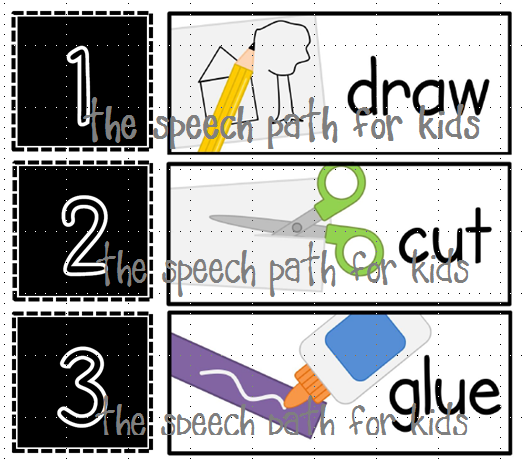 I used a product that I purchased from Ashley Hughes to create a visual to sequence the steps. 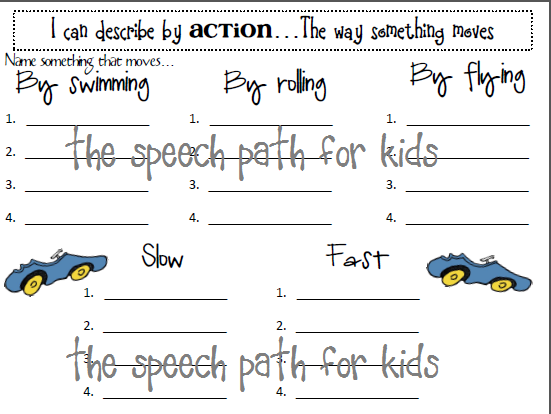 I also used this for kids to request the action they would like to help with. 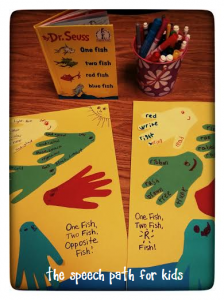 First we drew the fish (traced hands), then cut, and last glued the fish. Each group added different vocabulary depending on their goals. 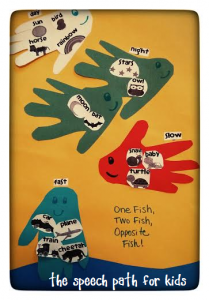 Many of the groups added opposites that we found in “One Fish, Two Fish” and “The Foot Book”. 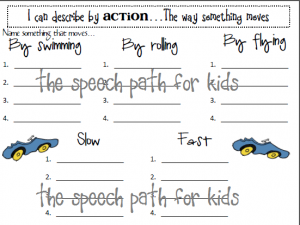 My articulation groups searched for their target sound throughout his books. 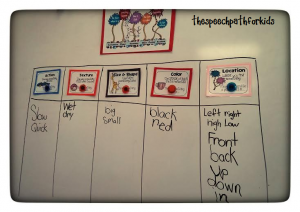 My favorite activity was using pictures to sort items between categories of wet/dry, big/small, fast/slow, day/night. 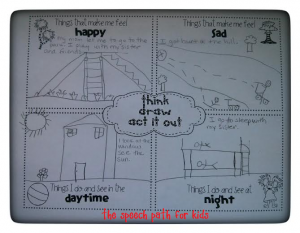 I used a visual template for students to “Think, Draw, Act it Out”. Students brainstormed something that fits in each category, wrote a sentence, drew it, and then we acted it out. I was trying to incorporate as many brain paths as possible! Again, we were reinforcing the opposites along with descriptive language. 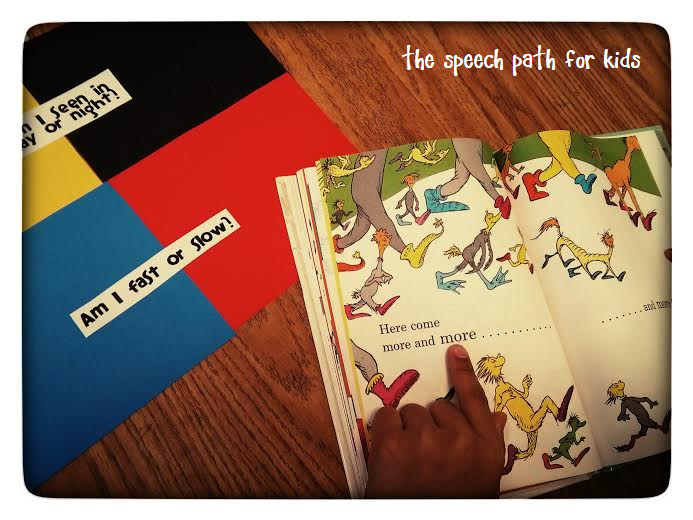 Some of my students listened for descriptive language as I read “The Foot Book”. Once they identified the word, they had to decide what it was describing (time, location, color, size/shape, action, texture). They loved filling in a chart on the board. I also followed up this activity on another day with them creating a list of items within each category. For example, for texture: Name something that is scratchy, wet, furry, soft, etc. Students used a written template to complete this. 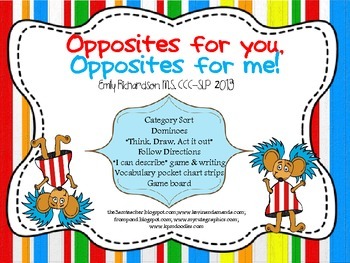 You can find these materials (except for the choice boards) in my packet “Opposites for You, Opposites for Me”. It focuses on descriptive language, following directions, category sorts, and the concept of opposites. I would love to hear how you are using Dr. Seuss stories in therapy this week!